The .30 Carbine (7.62×33mm) is a rimless carbine cartridge used in the M1 carbine introduced in the 1940s. It is a light rifle round designed to be fired from the M1 carbine's 18-inch (458 mm) barrel. 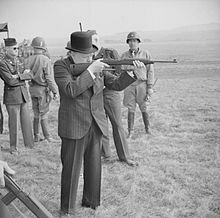 Shortly before World War II, the U.S. Army started a "light rifle" project to provide support personnel and rear area units more firepower and accuracy than the standard issue M1911A1 .45 ACP handgun, and weigh half as much as a M1 Garand rifle or the .45 Thompson submachine gun. The .30 Carbine cartridge was developed by Winchester and is basically a rimless .30 caliber (7.62 mm) version of the much older .32 Winchester Self-Loading cartridge of 1906 introduced for the Winchester Model 1905 rifle. The .30 Carbine uses a lighter bullet and more modern powder. As a result, it is approximately 600 feet per second faster and 27% more powerful than its parent cartridge. The .30 Carbine's relatively straight case and the rounded nose of its bullet led some to believe it was designed for use in pistols. At first, Winchester was tasked with developing the cartridge but did not submit a carbine design. Other firms and individual designers submitted several carbine designs, but most prototypes were either unreliable or grossly off the target weight of five pounds. Major Rene Studler persuaded Winchester that the Winchester M2 .30-06 rifle, a design started by Ed Browning and perfected by Winchester engineer Marshall Williams, could be scaled down for the .30 Carbine cartridge. The result was the M1 carbine. The M1 carbine was issued to infantry officers, machine gun, artillery and tank crews, paratroopers and other line-of-communications personnel in lieu of the larger, heavier M1 Garand. The weapon was originally issued with a 15-round detachable magazine. The carbine and cartridge were not intended to serve as a primary infantry weapon, nor was it comparable to more powerful intermediate cartridges later developed for assault rifles. The M2 carbine was introduced late in World War II with a selective-fire switch allowing optional fully automatic fire at a rather high rate (850–900 rpm) and a 30-round magazine. The M1 and M2 carbines continued in service during the Korean War. A postwar U.S. Army evaluation reported that "[t]here are practically no data bearing on the accuracy of the carbine at ranges in excess of 50 yards. The record contains a few examples of carbine-aimed fire felling an enemy soldier at this distance or perhaps a little more. But they are so few in number that no general conclusion can be drawn from them. Where carbine fire had proven killing effect, approximately 95 percent of the time the target was dropped at less than 50 yards." The evaluation also reported that "[c]ommanders noted that it took two to three engagements at least to settle their men to the automatic feature of the carbine so that they would not greatly waste ammunition under the first impulse of engagement. By experience, they would come to handle it semiautomatically, but it took prolonged battle hardening to bring about this adjustment in the human equation." U.S. Army specifications for the new cartridge mandated the caliber to be greater than .27, with an effective range of 300 yards or more, and a midrange trajectory ordinate of 18 inches (460 mm) or less at 300 yards. With these requirements in hand, Winchester's Edwin Pugsley chose to design the cartridge with a .30 caliber, 100–120 grain bullet at a velocity of 2,000 feet per second (610 m/s). The first cartridges were made by turning down rims on .32SL cases and loading with .308 caliber bullets which had a similar profile to those of the U.S. military .45 ACP bullets. The first 100,000 cartridges manufactured were headstamped ".30 SL" (for "self-loading"). The popularity of the M1 carbine for collecting, sporting, and re-enactment use has resulted in continued civilian popularity of the .30 Carbine cartridge. For hunting, it is considered a small-to-medium-game cartridge. With millions of surplus M1 carbines still owned by civilians, the round continues to be used for these purposes. A number of handguns have been chambered for .30 Carbine ammunition. In 1944, Smith & Wesson developed a hand-ejector revolver to fire .30 Carbine. It went through 1,232 rounds without incident. From a four-inch (102 mm) barrel, it launched the standard GI ball projectile at 1,277 ft/s (389 m/s), producing an average group of 4.18 inches (106 mm) at 25 yards (23 m); the military decided not to adopt the revolver. The loud blast is the most oft-mentioned characteristic of the .30 Carbine cartridge fired in a handgun. In 1958, the short-lived J. Kimball Arms Co. produced a .30 Carbine caliber pistol that closely resembled a slightly scaled-up High Standard Field King .22 target pistol. The Ruger Blackhawk revolver chambered for the .30 Carbine round has been in the catalogs since the late 1960s. Standard government-issue rounds clock over 1,500 ft/s (460 m/s), with factory loads and handloads producing similar velocities. Plainfield Machine Corp, produced M1 carbines from 1960 to 1977, when they were bought out by Iver Johnson Corp, who has manufactured them at least until a 50th anniversary model in 1993. The Taurus Raging Thirty and AMT AutoMag III were offered in .30 Carbine. The .30 Carbine was developed from the .32 Winchester Self-Loading used in an early semi-auto sporting rifle. A standard .30 Carbine ball bullet weighs 110 grains (7.1 g); a complete loaded round weighs 195 grains (12.6 g) and has a muzzle velocity of 1,990 ft/s (610 m/s), giving it 967 ft⋅lbf (1,311 joules) of energy when fired from the M1 carbine's 18-inch barrel. By comparison, the .30-06 M2 cartridge for M1 Garand rifle fired a ball bullet weighing 152 grains (9.8 g) at a muzzle velocity of 2,805 ft/s (855 m/s) and 2,655 ft⋅lbf (3,600 joules) of muzzle energy. Therefore, the M1 carbine is significantly less powerful than the M1 Garand. Another comparison is a .357 Magnum cartridge fired from an 18" rifle barrel, which has a muzzle velocity range from about 1,718–2,092 ft/s (524–638 m/s) with energies at 720–1,215 ft⋅lbf (976–1,647 J) for a 110 gr (7.1 g) bullet at the low end and a 125 gr (8.1 g) bullet on the high end. As a hunting arm, the M1 carbine is approximately the equivalent to a .357 Magnum lever-action rifle. .30 Carbine sporting ammunition is factory recommended for hunting and control of large varmints like fox, javelina, and coyote. However, the game laws of several states do not allow hunting big game (deer, bear, or boar) with the .30 Carbine either by name or by minimum muzzle energy required. France WWII lend-lease, First Indochina War and (1954–1962, Algerian War). Manufactured as the Modèle 50 pour Carabine cartridge. Cartridge, caliber .30, carbine, ball, M1. It came in cartons of 50 cartridges. Cartridge, caliber .30, carbine, grenade, M6. The grenade blank was used with the M8 rifle grenade launcher. It came in cartons of six cartridges. Cartons issued in metal ammo cans were made of plain pasteboard, while individual cartons were sealed and waterproofed with a wax coating. Cartridge, dummy, caliber .30, carbine, M13. This cartridge was used to safely teach loading and unloading the M1 carbine to recruits. Cartridge, caliber .30, carbine, ball, high pressure test, M18. This cartridge was used to proof the carbine and its components at the factory or an army arsenal. Cartridge, caliber .30, carbine, tracer, M27. It came in cartons of 50 cartridges. The .30 Carbine was the basis for Melvin M. Johnson's .22 Spitfire, necking the .30 Carbine's case down to a .22 caliber bullet, for a conversion of the M1 carbine. ^ Ian V. Hogg; John S. Weeks. (2000). "Rifle and machine gun ammunition chart". Military Small Arms of the 20th Century (7th ed.). Krause Publications. p. 407. ^ "CARTRIDGE AND CHAMBER DRAWINGS CENTERFIRE RIFLE" (PDF). Sporting Arms and Ammunition Manufacturers' Institute (SAAMI). Archived from the original (PDF) on 2014-07-14. ^ "Rimless cartridges, Calibres of rifled long centre fire weapons for rimless cartridges". Commission Internationale Permanente pour l'Epreuve des Armes à Feu Portatives (Permanent International Commission for portable firearms testing) (C.I.P.). Archived from the original on 2014-07-14. Retrieved 2014-07-02. ^ "30 CARBINE 110 GR. FULL METAL JACKET". Winchester. Archived from the original on 2014-11-02. Retrieved 2014-07-02. ^ a b Barnes, Frank C., Cartridges of the World, DBI Books, 1975, 1989. ^ Schreier, Konrad F., Jr. (1990). Winchester Centerfire Automatic Rifles. ARMAX: Journal of the Buffalo Bill Historical Center, Vol. III(1): p. 36. ^ a b Cumpston, Mike, "The .30 Carbine Blackhawk: Ruger's Enduring Dark Horse", Guns Magazine, December 2001, San Diego, Von Rosen Publications. ^ "BBTI - Ballistics by the Inch :: .357 Mag Results". www.ballisticsbytheinch.com. ^ a b "CARABINA - CT 30 - Calibre Restrito". Retrieved 9 October 2011. ^ Hogg, Ian (1989). Jane's Infantry Weapons 1989–90 (15th ed.). Jane's Information Group. p. 216. ISBN 0-7106-0889-6. ^ Jones, Richard (2009). Jane's Infantry Weapons 2009–2010. Jane's Information Group. p. 898. ISBN 0-7106-2869-2. This page was last edited on 12 February 2019, at 05:24 (UTC).